The Grinch might be trying to steal Christmas this year – but it won’t stop you from making this Christmas an extra special one for your loved ones ... give them a movie gift card this Christmas and you could WIN*. 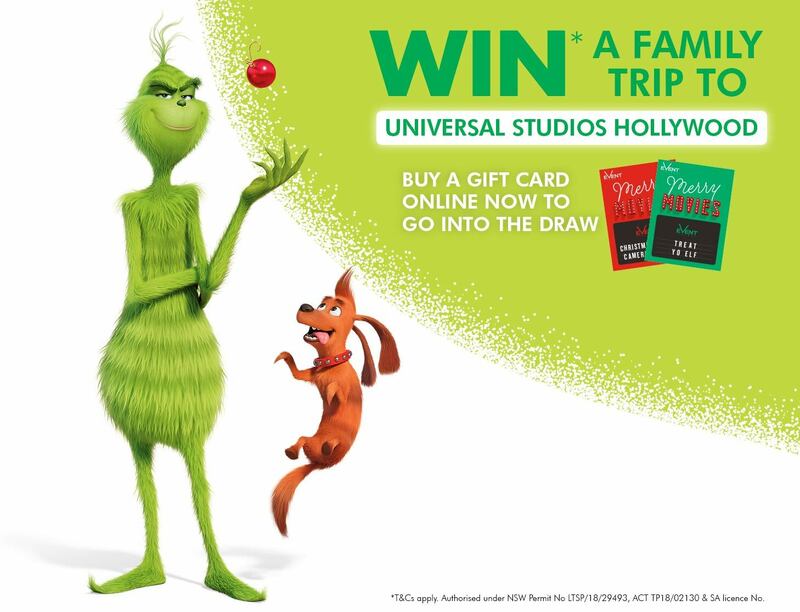 Purchase a Gift card or e-Gift Card online from the Event Cinemas Gift Shop during the Promotional Period and you will automatically go in the draw to Win* a Family trip to Universal Studios Hollywood. Treat the family and buy them a gift card online today! *Authorised under NSW Permit No LTSP/18/29493, ACT TP18/02130 & SA licence No. SA licence No. T18/1926. Promotion commences Thursday, 8 November 2018 at 09:00am AEDT and closes Sunday, 16 December 2018 at 23:59pm AEDT.